The United States has a military presence in two-thirds of countries around the world, and some of them have had enough. A group of terrorists calling themselves The Engineers have had enough and initiate a terror ultimatum called the Blacklist - a deadly countdown of escalating attacks on U.S. interests. A group of terrorists calling themselves The Engineers has had enough of US military occupation all over the world and initiates a terror ultimatum called the Blacklist – a deadly countdown of escalating attacks on US interests. When our nation is threatened, the president turns to one man and one man only: Sam Fisher. Armed with state-of-the-art technology, top-of-the-line gadgets, deadly combat abilities, and an elite team of experts, Sam Fisher holds nothing back to get the job done using whatever means necessary. Five armor accessories: Gold Sonar Goggles, Amber Sonar Goggles, Ghost Boots, Armored Boots, and Tactical Gloves. Operate Without Restrictions: Sam is back in his tactical suit and goggles, and he’s more lethal and agile than ever. Granted the freedom to do whatever it takes to stop the Blacklist, Sam flies from exotic locales to U.S. cities as he races against the clock to find out who’s behind this devastating threat. Tools of the Trade: Take down The Engineers by using new gadgets such as the upgraded Snake Cam and Micro-trirotor Drone. Splinter Cell Blacklist is also bringing back fan-favorites like the Sticky Shocker and the brutal, curved Karambit knife. Fans of stealth will be happy to make the most of Sam’s sneaking abilities to abduct and carry enemies, while Killing In Motion allows the player to strike with surgical precision by marking and executing multiple enemies in one fluid motion. Build a New Echelon: Sam is building a whole new Echelon unit; his team, his way. Anna “Grim” Grimsdottir is his technical operations manager, CIA operative Isaac Briggs brings additional firepower, and resident hacker Charlie Cole rounds out the crew. 4th Echelon is a fully mobile ops unit with unlimited resources and cutting-edge technology aboard the repurposed stealth airliner, the Paladin. Enjoy a Fully Integrated Experience: Sam and his team are aware of terrorist attacks in real time thanks to the Strategic Mission Interface (SMI). The SMI allows 4th Echelon to receive data about mission objectives while on the move. With the SMI, players can take advantage of the universal game economy system that allows players to fully customize and upgrade Sam, his suit, goggles, weapons, the Paladin and much more. Spies vs. Mercs Returns: Spies vs. Mercs is back with an new take on asymmetrical gameplay. Players will be able to face off in teams of 4 all the while creating their very own Spy or Merc according to their playstyles via thorough customization elements. The original Classic Spies vs. Mercs experience also makes its long awaited comeback for the fans. COOP: With the SMI, the lines are blurred between the single campaign and COOP as the narrative is deepened with Sam and Briggs. Earn in-game currency and unlock additional weapons or gadgets via specialized missions assigned by Grim, Briggs, Charlie and Kobin. © 2013 Ubisoft Entertainment. All Rights Reserved. 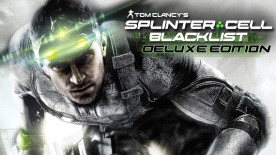 Tom Clancy's, Splinter Cell, Blacklist, Sam Fisher, the Soldier Icon, Ubisoft and the Ubisoft logo are trademarks of Ubisoft Entertainment in the U.S. and/or other countries.